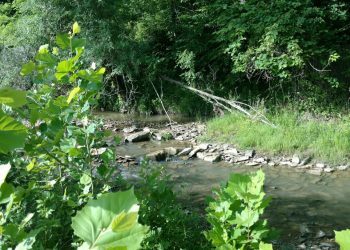 The Candy Run Stream Restoration Project restored 9,500 linear feet of Candy Run within the Lower Scioto River watershed (HUC-11 05060002-161) as part of the compensatory mitigation required for the ODOT Portsmouth Bypass. Candy Run in its existing condition was in non-attainment of its WWH aquatic life use designation with a QHEI of 53. 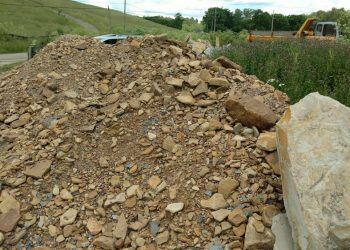 The low score was a result of indirect habitat alterations and instability through active pasturing activities and instream gravel mining. 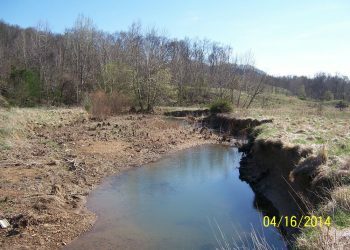 The factors most limiting the QHEI score in the project area are bank erosion, siltation, lack of in-stream cover, lack of well-defined riffles, lack of wooded riparian buffer, and overall lack of substrate in many areas. While natural recovery was possible with time, there was a high potential of restoration success using NCD active restoration because the limiting impairments could be restored immediately through construction activities. This was further reinforced by upstream and downstream evaluations where habitat scores reach an exceptional level. 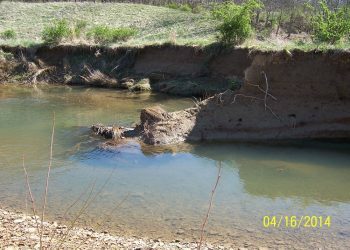 To restore the Candy Run stream, a functional floodplain was necessary to reduce bank heights and decrease active erosion. 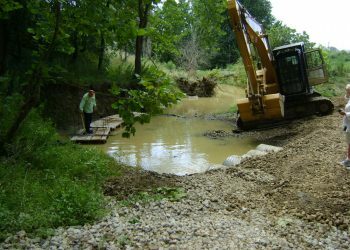 In the upper portion of the project this was accomplished by excavating a new floodplain bench while adding substrate back to the bankfull channel. Excavation depths were minimized in the most downstream portion of the project, where substrate was added to the channel to raise the channel invert to within a functional height. Throughout the restored area additional instream habitat features were installed such as fish lunkers and root wads. In conjunction with stream restoration, Oxbow installed bat poles along the stream corridor. 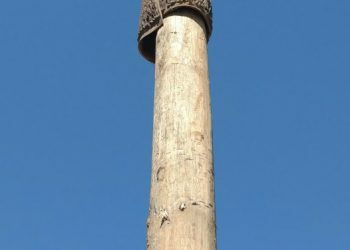 Each bat pole uses an artificial bark as a mitigation/habitat enhancement tool specifically designed for long term habitat improvement for bark roosting bats, including the federally endangered Indiana bat. This is the first site to use the poles in Ohio. The Candy Run project was completed in 2016. It is predicted that monitoring in 2017 will show an improvement in not only habitat but the macroinvertebrate and fish communities suitable for WWH with a future trend to EWH as is found both downstream and upstream of the project area.